Despite the fundamental importance of BCL11A’s role in HbF regulation, much of hemoglobin switching remains poorly understood. 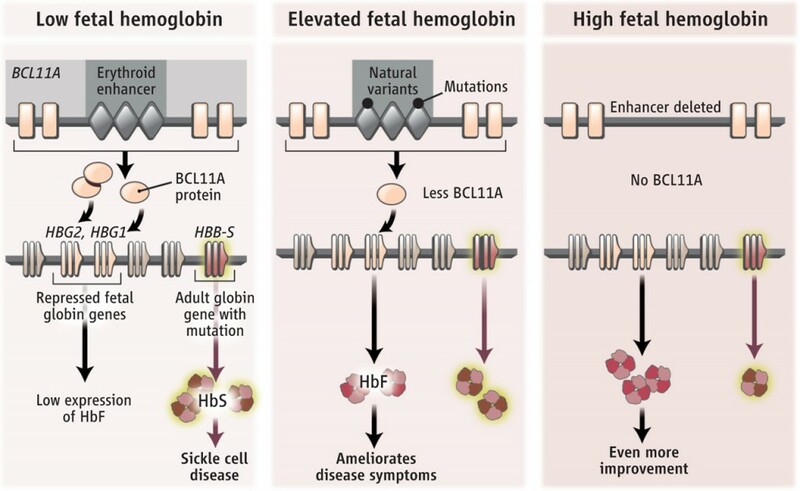 Critical regulators of fetal hemoglobin level remain to be discovered. First, the upstream signaling pathways activating BCL11A in adult-stage erythroid cells are largely unknown. Second, the cofactors interacting with BCL11A only explain a fraction of BCL11A’s effects, implying additional cooperating factors. Finally, even in the absence of BCL11A, hemoglobin switching still occurs (albeit at reduced amplitude), suggesting that independent pathways contribute to γ-globin repression in adult erythropoiesis. We have conducted a genome-scale pooled shRNA screen in primary human erythroid precursors to discover novel regulators of HbF. We are using CRISPR/ Cas9 for orthogonal discovery and validation. Current projects include conducting mechanistic studies of individual candidates. These studies are expected to identify novel regulators and therapeutic targets that contribute to hemoglobin switching upstream, downstream, and parallel to BCL11A. 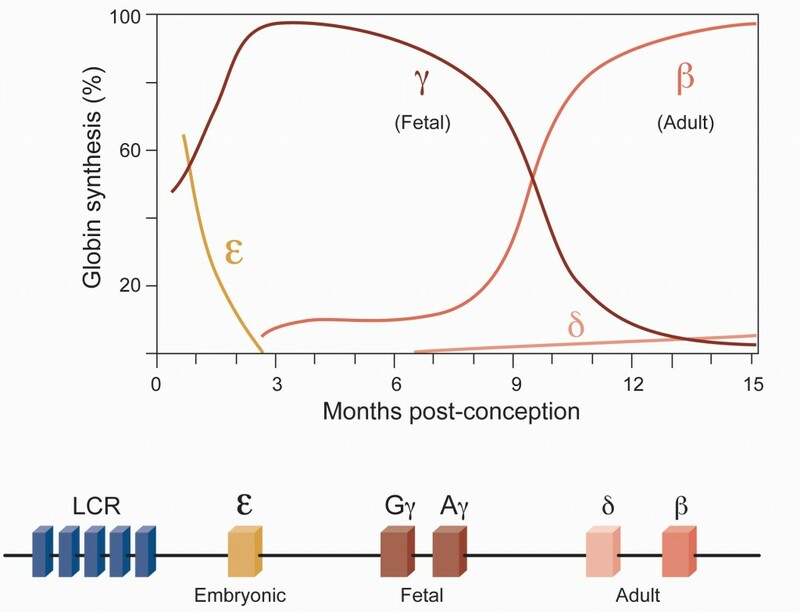 Image: Hemoglobin switching refers to the changes in globin gene expression during ontogeny. The switch from [gamma]- to [beta]-globin expression is of particular clinical importance for the [beta]-globin disorders. Adapted from Bauer, Kamran, Orkin, 2013. Therapeutic Genome Editing The β hemoglobinopathies comprise the most common monogenic diseases worldwide, characterized by mutations of the β-globin constituent of hemoglobin. Re-induction of fetal hemoglobin (HbF) would counteract the fundamental molecular defect and constitute curative therapy. Recently we identified an adult-stage erythroid enhancer of BCL11A as a critical determinant of HbF level subject to common genetic variation associated with β-hemoglobinopathy disease severity. We predict that disrupting this genetic element would ameliorate disease by mimicking protective genetic variation. Therapeutic application of genome editing technology allows the precise modification of genetic sequences in human cells. This modality represents a promising novel treatment strategy for genetic diseases, particularly for blood disorders given the ease of autologous hematopoietic stem cell (HSC) harvest, manipulation, and transplant. Ongoing projects are to identify minimal sequences necessary for BCL11A erythroid enhancer function; compare technologies for genome editing in primary human HSCs; and determine the safety and efficacy of such edited cells in reconstituting hematopoiesis. These experiments will enable the development of clinical trials of therapeutic genome editing for the β-hemoglobinopathies. Image: Schema of disruption of BCL11A erythroid enhancer to raise HbF levels in [b]-globin disorders. Adapted from Hardison & Blobel, 2013. Blood cell traits both represent an auspicious model to investigate genetic determinants of human phenotypic diversity and are themselves of direct clinical significance. GWAS have identified numerous loci critical for hematopoiesis, but the underlying elements and genes responsible have in only a few cases been identified and validated. We hypothesize that common genetic enhancer variation is a paradigm for the determination of traits by modulating lineage-specific gene expression. E.g. we find that ~50% of the GWAS-marked loci associated with fundamental erythroid traits have at least one trait-associated variant falling directly within an erythroid enhancer, which represents highly significant enrichment as compared to control variants or enhancers. Many enhancers are thought to be redundant or compensated fine-tuners of gene regulation, for which genetic variation has minimal impact on gene expression. We hypothesize that trait-associated enhancers are critical nodes establishing cell-type-specific chromatin state, gene expression pattern, and cellular outcome. Ongoing projects are to use genome editing to disrupt trait-associated enhancers as well as non-trait-associated enhancers. These results promise to not only uncover novel mechanisms of blood cell development but also promote an understanding of the genetic architecture of complex traits. Image: Whole embryo Xgal staining of BCL11A+52-64:lacZ Tg E12.5 mouse embryos. 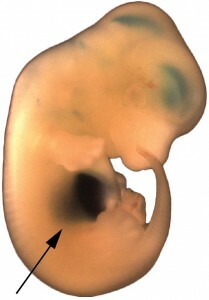 Restricted expression of reporter activity to fetal liver (arrow), site of definitive erythropoiesis, demonstrates that the GWAS-marked element is sufficient to drive appropriate lineage-restricted gene expression. Adapted from Bauer et al., 2013.